David Pauley was a mess, giving up four runs in the third, then three more in the fifth without recording an out. He hit poor Jorge Velandia after Joe Inglett tripled and got Sergio S. home. So yeah, it went single, triple, HBP, coaching visit, single, walk... EXTRACTION! DP is replaced by Edgar Martinez. Martinez pitched two scoreless innings with one strikeout. Lefty Jon Switzer entered and gave up the eighth run, then Bryan Corey pitched a scoreless inning and a third. Syracuse starter and aching lefty John Parrish pitched 6 1/3, giving up four runs on seven hits. He struck out Kottaras and Madera. Amongst the game's relievers were Jo Matumoto and Jordan De Jong. XBH for Pawtucket: three doubles between Bailey and Velazquez. Sean Danielson was picked off after he walked in his first at-bat, but later on stole second when he reached on a fielder's choice. Danielson did not record a hit in his first AAA game. ORANGE POWER! Russ Adams hit a three-run homer off Pauley. Jorge Velandia had a solo shot off Switzer. And then there's that Joe Inglett triple. 1. Joe Inglett was up in Toronto having a great time (okay, probably an awkward time) until Adam Lind came off the DL. He joined Syracuse on April 28th and is batting .404 in 13 games. 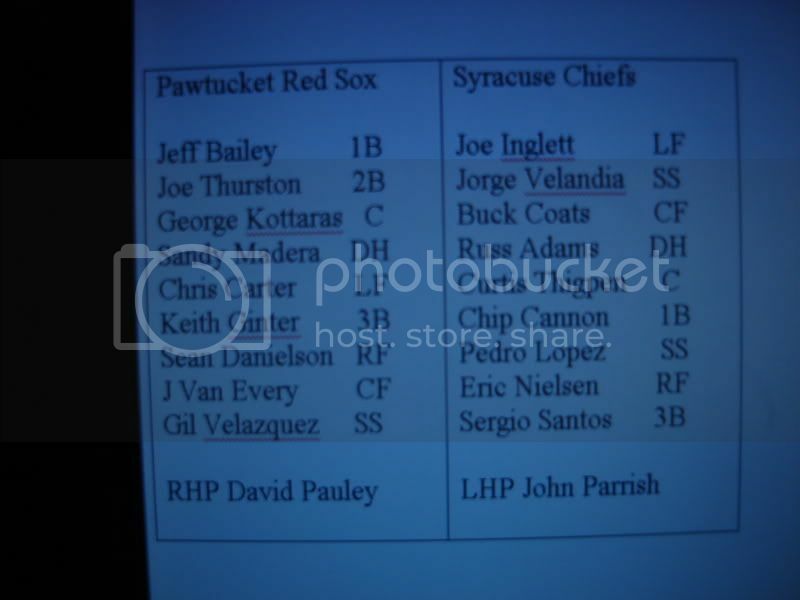 Inglett has probably been to Pawtucket more often than I have. 2. Sean Danielson! Danielson was a PTBNL from the Cards' org when the Joel Pineiro thing went down. He's been in Portland and aging rapidly. He is also shorter than Dustin Pedroia. So he's been transferred to Pawtucket. I don't think I understand. I was hoping for a Corsaletti summer. 3. "Mark" had this to say: "I’ll tell you as a guy that has played next to Sean Danielson, you want him in your dugout. He is one of the scrappiest guys i’ve ever met, knows no speed but full speed (and thats FAST). Undersized but will not quick working till he achieves what he wants"
I recommend a click on that link to read Danielson's RAVE reviews. Last game v. Chiefs tomorrow. Then homecoming. I WILL be at the park. Come say hello! I miss you guys!